A small but hardy dog was found centuries ago in the remote, misty green hills of Cardiganshire in Wales. He was a “Corgi,” “Cor” for dwarf (or perhaps “cur” for working dog) and “gi” (with a hard G sound) for dog. This “ci” or yard-long dog was highly valued by his family as an affectionate companion, guard, general farm worker, and driver of cattle. In fact, ancient Welsh law provided for severe penalties to those who harmed or stole one of the little “corgwn,” because the corgi’s talents could help determine his family’s economic status. 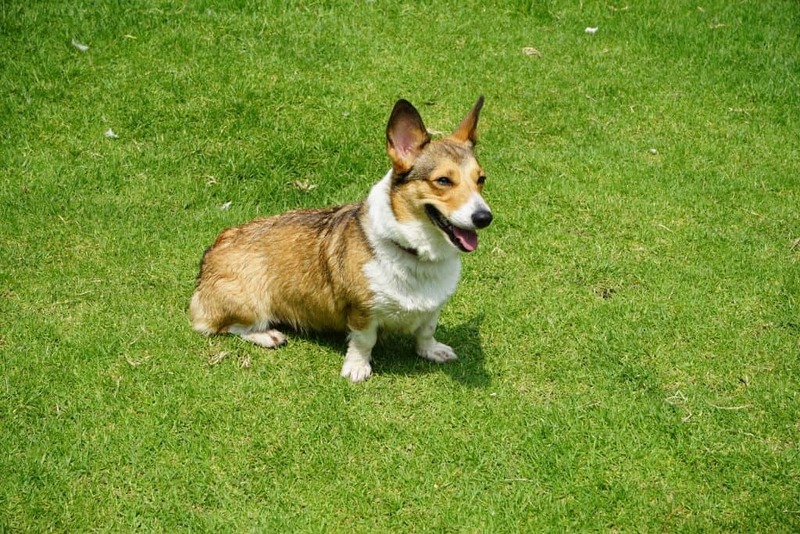 Never numerous and sometimes confused with the more common tailless Pembroke Welsh Corgi, the Cardigan is a separate breed of ancient lineage, descended from the Teckel or Dachshund family. The earliest Cardigans were heavy, golden or blue merle with perhaps drop ears. Careful crosses were made with working qualities in mind, probably with brindle and red herders; the result was also more refined, dignified and foxy-looking. The first pair of Cardigans was imported to the United States by Mrs. B.P. Bole in 1931, with the Welsh Corgi recognized by the American Kennel Club in 1934, and the Cardigan and Pembroke Welsh Corgis recognized separately in December, 1934. The Cardigan Welsh Corgi Club of America was founded in 1935. The Cardigan has gone from the Non-Sporting to the Working to the Herding Group. The average size is handy, approximately twelve inches at the shoulder with females ideally ranging from 25-34 pounds and males from 30-38 pounds. The Cardigan’s practical coat is medium length and double with a variety of colors, shades and patterns: brindle (which gives a wood grain effect), red (brown or golden), sable (with black hair tips), blue merle (black and grey marbled) and black. Blues and blacks can have “points” (cheeks and eyebrows) in either tan (for a tricolor) or brindle. White flashings are usual on the neck (as a partial or full collar), chest, legs, muzzle, underparts, tip of tail and blaze. Black masks are acceptable along with some ticking (freckles). With reasonable care, the average lifespan of a Cardigan is around 12-15 years, with 16 and 17 not unheard of. All Corgis deserve good care, which includes a secure place, a good diet and water, exercise, veterinary visits and vaccinations, general grooming (including nails and teeth), socialization, training and love. If not show quality, he/she should be neutered or spayed; a litter requires many considerations including genetics, time, effort (!) and expense. Owners should be careful about allowing puppy Cardis, with their very distinctive front assembly, to jump down. Note that a very young puppy has drop ears; usually those big ears will come “up” on their own, but occasionally ears are temporarily supported with tape. A Cardigan should be picked up by placing one hand under the chest behind the front legs with the other hand supporting the hindquarters. The Cardigan is generally an active dog, but in adulthood he doesn’t get carried away with it. He has a stamina and LOVES walks and romps, but doesn’t absolutely require more exercise than he gets around the house and yard. With exercise, he can be quite athletic with surprising ball-chasing speed. The Cardigan’s coat is all-weather and generally clean and odorless. It is best if brushed once a week to remove dead hair. Like most dogs, he does shed roughly twice a year; in keeping with his moderate coat, the amount isn’t extreme. A puppy is a long-term, emotion-filled investment and should be purchased carefully. With needs including proper health care and socialization, a puppy should NOT be purchased from a pet shop. A responsible and knowledgeable breeder is important. Breeders directories can be obtained from the CWCCA. If you need a contact address or telephone number, contact the American Kennel Club at 51 Madison Ave., New York, NY 10010 or 1-900-407-PUPS. In looking for a Cardigan, expect to be interviewed by a reputable breeder as to your qualifications to own and care for a special puppy. As a recognized AKC breed, the Cardigan can compete in AKC dog shows. However, he does not have to be limited to conformation. In keeping with their Welsh farm heritage and intelligence, Cardigans do well in obedience, tracking, agility and, of course, herding trials. If you would like to participate in these activities, your dog’s breeder, the CWCCA or the AKC can offer advice. The CWCCA is devoted to the appreciation and advancement of the Cardigan Welsh Corgi. To that end, Specialty Shows with seminars are held yearly in different regions of the country, the Cardigan News-Bulletin and Newsletter are published several times a year, and a Yearbook is published every other year. In addition, the Club has many committees, including Rescue and general education. A current Breeders Directory is available through olynmawr@aol.com.